This year also we are planning to travel during X'Mas time and want to visit some hilly areas. But I am confused :confused:where to go and which is the best during winter. Please suggest some places in India (( Please exclude Rajasthan,Vizag,Nainital,Kaushani,dooars as we have beeen already in these places)) where we can explore this time. I know you people are very helpfull and will help us sure....Suggest as much as you know , then I definitly search IM to explore more..I just need your help to sort out the best place ..
Manali for snow, kumaon for amazing weather and clear skies and best himalayan views.Kashmir again for snow. Any reason for not keeping Kausani and Munsiyari in this elite list, like very touristy or not accessible during winter etc..?? But I would agree, all these places you listed above are simply brilliant. Though I am not sure if Christmas is little too late to enjoy the crystal clear weather (Haze/Mist/Fog free) of Kumayun which I believe is at its best from Late Oct to may be till early December. | Out of coverage area. Though I am not sure if Christmas is little too late to enjoy the crystal clear weather (Haze/Mist/Fog free) of Kumayun which I believe is at its best from Late Oct to may be till early December. Pic 1- Taken on the day of Christmas, from Chaukori. Pic 2- Same day. Sunset at Munsyari. Agree with others, even to me Kumaon is your best option. Crystal clear sky and stupendous views. Brilliant and Fabulous snaps Sagarneel. Which year this was, 2010? Also why not Sikkim and Arunachal should be proposed and added to that list as I believe those places only offer good weather during that short span between Oct to Jan and fabulous during winter. Brilliant and Fabulous snaps Sagarneel. Which year this was, 2010? . I believe now but with a question, hope it's the rule and not exception in your case (Still have doubts as I know Mountain weather God is always little too inclined towards you for some reason ;)). Also why not Sikkim and Arunachal should be proposed and added to that list as I believe those places only offer good weather during that short span between Oct to Jan and fabulous during winter. Sikkim is definitely a good option, but not the best option IMO, since North Sikkim might get blocked due to heavy snow during that time, and reaching the likes of even Yumthang may be a problem if one is unfortunate. 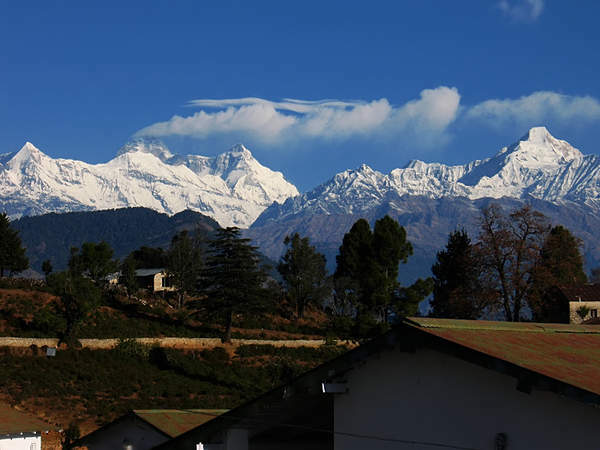 So, if I weigh between the rest of Sikkim and Kumaon, I would be a tad inclined for Kumaon, simply because of the splendidly clear weather it offers. Although, that takes nothing away from Sikkim, and you know that :D.....this is the official logic. (the unofficial logic, i.e the real reason is - I guess I am now jealous of the fact that I have been advising people on Sikkim, watching them go come back and write travellogues, while I am silently repenting here sitting here in Delhi :D). Never been to Arunachal, so can't really say how good it is during winters. I just shot off the first few names that came to mind. Yes, Kausani can be added. So can Munsyari, except that you only get to see Panchchuli, unless you trek to Khaliya. If there's heavy snow, the shorter way to Munsyari can be blocked, but then the longer way via Jauljibi is open. If there's no rain, all of December provides clear skies across northern UA. Thanks!! so now I am convinced of visiting the place in Nov/Dec but want to put Corbett NP with that, so would need your help in getting a itinerary. My experience in the state is that Nov to Feb is never an issue with views (barring the odd days of bad weather or storms). Depends which part of Garhwal you want to see, then it'll be easier to suggest day treks etc. Unless you want to see all the hill-stations :), then I suggest you start in the west (Chakrata) and work your way across. Actually east to west works too, no issue. I know Garhwal is in UA but when we are so specific on UA weather without mentioning much on HP which is also a neighbouring state, I thought it's wiser to get it clarified about Garhwal weather separately :D.
I can start from West i.e. Chakrata, so what should be nearest Rail head/Airport? Also give me brief outline of any loop / major places that I can cover in 2 weeks comfortably using hired car keeping in mind scneic places should be covered and don't want to touch upon religious and touristy places. If you think I should read something before asking questions, refer me some good materials/sites/threads/posts so that I can read and comeback with more specific question. Honestly I have no idea on this specific part of Himalaya.